Today the Minister of Health, Dr. Pariranyetwa and Dr. Chombo the Minister of Local Government and National Housing and Public Works arrived by helicopter with our Minister of Parliament, Dr. Gandawa and several top government officials from the Ministry of Health.They discussed with us what happened and pledged their total support to rebuild the buildings destroyed and have people here quickly to assess if the buildings can be saved at all or new buildings have to built and how.They promised that something would get started and accomplished this year, not waiting until 2014! How exciting is that? We gave officials a tour of the fire damaged buildings as well as a tour of the hospital.We only had 5 patients admitted and 3 in Maternity and one in Labor.We had a busier outpatient today and Antenatal Clinic as well as our ART and TB patients for refills, so it was quite busy today.Slowly we are building up patients. At 0230 on the morning of 21-November-2013 the guards at the hospital saw flames coming out of the locked kitchen at Chidamoyo Christian Hospital.Immediately the Administrator and all people on the mission were alerted and came to the hospital to help. 15 fire extinguishers were used to try and stop the spread of the fire but it quickly spread to the laundry on one side and the drug storeroom on the other side.While Major was using the fire extinguishers on the kitchen door part of the ceiling fell in and hit him on the side of the face and spun him around.In the smoke he was disoriented and flames were on 2 sides of him.The driver of the construction company came up and pulled him out!He went on to continue fighting the fire for 4 more hours! Lots of projects are coming together this week and we are happy to see some completion! First we have been busy laying down pipes from the new borehole to the water tanks up on our hill.Working in this summer heat has been a big job for the men digging and laying the pipe—seems it is all in the sun and not in the shade.We have also bought a new pump we will use and also have finished the pump house around the new borehole.We are hoping this project will be done in the next month. 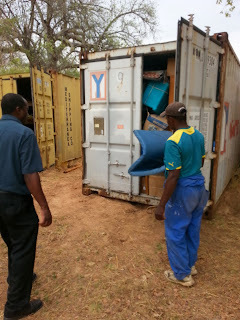 Last week on Saturday a 20 foot container sent from Sebastopol Christian Church arrived here at Chidamoyo! It had been sent in June and so we were very anxious for its arrival. On Thursday we started to unload it. We unload it bit by bit as we have time and bring the boxes and barrels to the hospital and put in the hallway outside my office. Then as I have time we unload and sort through the boxes. We have only been able to unpack a few things but we received new printers for the office, gauze and gloves which we were desperately in need off and some foley catheters. We will continue to work on it as we have time! We are so thankful so many nurses, doctors and other people who save these for us. Without these supplies we would not be able to afford them here. Thank you for all who save for us.